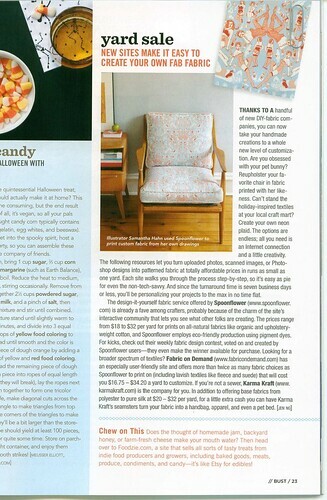 Now Bust Magazine is telling their readers about Spoonflower. They came over to shoot the chair this summer, we had a fun time trying to keep my dog out of the picture. The article is in their latest issue. Check it out online or from your news stand. Go Girl! That is awesome! I’m going straight to Barnes & Noble to check it out. How is the upholstery fabric holding up? Is it pretty durable? A friend wants me to cover her couch in one of my patterns. When I had it made they were not doing upholstery but they printed on canvas. It’s in perfect shape still. I scotch guarded it. I think they do upholstery now, pretty certain in fact. Check their site. You have a lucky friend! I’m sure your couch print will be awesome! Send it to Stephen at Spoonflower when it’s on there, he’ll love it! i love this AND your illo! this issue is like the samantha special! YAY!!! Thanks so much Lisa! I do feel lucky to be part of this issue. I love Ellen Page so much. Can’t wait for Franny’s Fri. XO. i just finished voting for the toile contest over at spoonflower, and as i got to the second page, i still hadn’t seen an entry that i felt like voting for until i saw yours. i then looked at the name and recognized it to be you. so i had to hop on over here to tell you this. great job samantha! oh thank you so much. that’s so sweet of you and means the world to me. it’s my first time entering the spoonflower contest and it’s a fun one. i love toiles. i meant to re-upload my image so you could see the detail more but never got around to it so i guess i’ll just leave it! Thanks again so much!